Oscar was physically challenged from his birth, but his story begins when I first spotted him. A few years back I went pet shop hoping to try to get advertisements for our newsletter. The last stop was a shop in another state. When I walked in with another SCEBC member, she noticed a cockatiel in a cage with a bunch of parakeets. She called me to the cage, knowing I wouldn't leave this little bird behind. I was shocked when I saw this bunch of white feathers, since it didn't look much like a bird, much less a cockatiel. This bird was a pitiful sight. He had no crest, tail or wing feathers (flight, 1st, 2nd, primary) and his feet were all disfigured, with all the toes wrapped around each other. (We later found out that over half of his toes never developed bones). The SCEBC member commented that "This one's for you Lisa....we know you can't leave it behind". As I watched this bird for a while, I noticed the parakeets beating on him as he huddled on the floor in fright. I asked the sales woman how much for the tiel and she remarked $150.00. Stunned, I looked at her and told her who I was and offered to give the bird a good home, along with a custom cage, and a girlfriend with similar disabilities. She plainly said she could care less about what I had to offer, and repeated the price, informing me she didn't care about the bird either....she had to recoup on the thing. Having bred tiels a few times, I knew that this lady was trying to pull a fast one on me. It was obvious how this bird would mature as soon as its pin feathers started coming in (there is something seriously wrong with no tail or wing feathers!) The sales woman and I argued over the price, and yes I wound up buying him. But the price was reduced to $25.00! I contacted a vet in the area and dropped the bird off for a checkup before it came home. When I returned the next day to pick him up, the vet remarked that I was a saint for taking in such a pitiful creature. There would be no charge for the health check, just my promise to give it a good home. Once home, Oscar was quarantined for 3 months in my bedroom. That's when he acquired the name "Oscar the grouch". After that period, it was off to see his new girlfriend and his custom cage. It was love at first sight. Soon after that I noticed one eye starting to turn cloudy and white. Once again off to the vet. It was determined he had cataracts. That was when this poor little creature started getting confused between day and night. He serenaded his girlfriend 24 hrs a day. She enjoyed it, but at 2 AM, I didn't. About a year ago, he became more quiet than usual, I noticed both eyes were now cloudy. The poor little guy is probably legally blind, to add to all his other problems. Many people would think that I am being selfish about keeping his around, and I should have him put down. Every once in a while he'll burst out in song at night. But usually before I get up to quiet him, you can hear a voice from a neighboring cage say "Oscar bad".....and then everyone falls back to sleep. I really don't know how old Oscar is, or how much time he has left, but we'll keep a close eye on him and make him as comfy as possible. 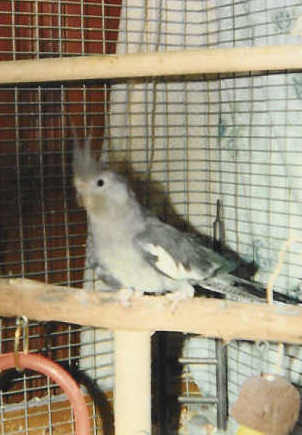 ED note: Both Oscar, a lutino male and Cricket, a whiteface hen, have since passed on. 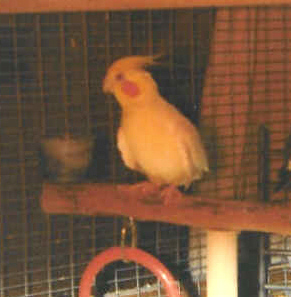 Cricket was the first to go, and disabled tiels were placed in the house with Oscar, but he did not respond to them as he had his cagemate of 8 years. Luckily he had memorized his ramps and perches, and where his food dishes were. He lived on for another year or so, and quietly went one night in his sleep. Oscar sat on his cowbell waiting patiently for it to hatch for nearly 3 years.